There will be those amongst you who thought that Sarah McIntyre couldn't possibly top the insane headgear that she wore to launch Oliver and the Seawigs (a six-foot pink confection with a sailing ship on the top). You were wrong. For the press launch of Seawigs follow-up Cakes in Space, Sarah sports a... well, I'll let you read the blog and find out. I particularly love the transformation that Sarah has wrought on Philip Reeve, who was such a quiet, reserved man when I first met him a few years ago, but is now wearing blue lipstick and dressing like 1970s David Bowie! There's more good news with another SCBWI book launch, this time for Cliff McNish's Going Home. In fact, it's a double SCBWI success, because Trish Phillips has illustrated the book and blogs about the launch over at Big Little Tales. K.M. Lockwood starts her latest blog post in something of a quandary. Should she be honest about a subject that's troubling her, or keep quiet for fear of making a bad impression? Fortunately for us, she plumps for the former and reveals her struggles with an unexpected problem - receiving praise for her work. Sarah Broadley is doing some hands-on research this week, at her local children's library. But after being thrown out by the librarians(! ), she returns home to share her own list of top 5 favourite picture books. Finally, Dave Cousins is reliving his days of being in a rock band by taking his latest book on tour. Charlie Merrick's Misfits is all about football, and Dave's school audiences have a lot of fun with felt-tips making some dream football kit designs. 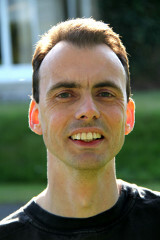 Nick Cross is a children's writer, ex-zombie and part-time superhero who was born with an intense phobia of Twiglets. Twice voted President of the Universe, Nick has been married on no less than twelve occasions and is a black belt in ju-jukebox (the ancient martial art of compiling playlists). A formidable sportsman, Nick was runner-up at the 2014 world tiddlywinks championship (he also holds the world record for wrapping sellotape around a small child). Nick's other hobbies include embroidery, chainsaw juggling, writing environmentally-sound haikus for Porridge Magazine and telling lies.